In the 2009 X-Force/Cable Messiah War crossover, Cyclops sends Wolverine and company into the future to search for Cable. They end up encountering the 800+ year old Deadpool (kept alive by his healing factor), now the self proclaimed emperor of the post-apocalyptic North America. 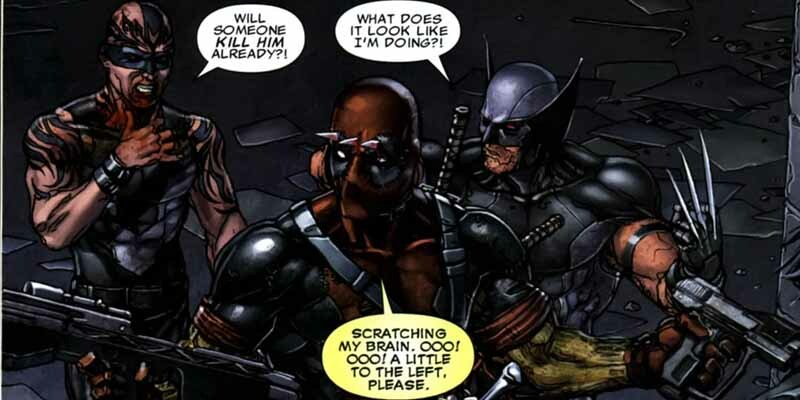 A misunderstanding leads to violence and Deadpool gets his head stabbed by Wolverine’s claw. Not only does he survive, but he does it in his signature style that makes a near-death experience hilarious.